Like an Amazon Echo Plus on steroids, wearing a striking Scandinavian coat: the Libratone Zipp 2 sticks to its successful roots, marrying great design with good sound, voice control and a decent app. For this much cash we’d like a little more audio precision and bass, though. Hygge: it's as to Denmark as Zen is to Japan. Which is the very design ethos behind the Danish-born Libratone Zipp 2: this material-clad cylindrical speaker has a warmth about it; a simplistic yet striking design that evokes feelings of comfort, while its sound strikes a chord of happiness - all staples of the 'hygge' concept. If you've been looking for an Alexa-enabled voice-control speaker that's got a bit more beef than Amazon's own Echo products then the Zipp 2 is a savvy choice. It's like an Amazon Echo Plus on steroids, wearing a striking and colourful Scandinavian coat. The Libratone Zipp 2 sticks to its successful roots - we tested the wool-clad original in 2012, followed by the re-work follow-up in 2016 (by which time the Danish company had been part acquired bought by Chinese entity) - marrying great design with quality sound, but updating features with voice control and an improved app. Is the Zipp 2 the wireless speaker to buy? There are stacks of portable Bluetooth speakers on the market. The Zipp 2 does things a little bit differently in terms of scale and positioning. It's certainly portable, in that it's easy to pick up and move about, but at this size we see this as a speaker for the home; one to move between living room, bedroom, kitchen and so forth. Or you can buy multiples and setup stereo and multi-room pairings. The design of the Zipp 2 isn't dramatically different from the second-gen Zipp from 2016. But it's still very striking: a cylindrical design that's finished with a wrap-around diamond-pattern semigloss thread coat, which literally zips onto the body (hence the product name). You can theoretically replace this jacket with other colourways, should you wish, although it's a rather tight fit - so we suspect most will buy the colour of their choice and stick with it. The zip itself is simply a design feature; that little point of fashionable difference that competitors typically lack. Up top the speaker has a touch interface with Libratone 'nightingale' bird logo, which illuminates when touched to display the main six controls: mic mute, wireless connectivity, room correction, favourites (radio stations only), SoundSpace multi-room, and firmware update. These controls are hidden unless you press-and-hold the nightingale, making for a neat-looking finish. A major feature of the Zipp 2 is how well it's connected. At launch it was the very first speaker with AirPlay 2, great for Apple users. It also features Spotify Connect, which will be a firm favourite for users not looking to switch systems to get their favourite music. There's Wi-Fi connectivity, Bluetooth 4.1, DLNA networking (for PC and Android), plus USB and 3.5mm physical ports for playing external sources as you please. Apple's AirPlay 2 explained: What is it and how does it work? We've been connected from phones and laptops without issue (except Bluetooth can be a little fussy when sources clash - a background video in a browser will cease playback of a different source, for example, with iTunes often firing up when you don't want it to do so). Add in Alexa voice control and you've got a veritable feast of ways to source and playback music. The Libratone app has also been improved through various iterations. It's now a great one-stop shop for connecting sources like Spotify and Tidal (each has its own dedicated section) or sourcing internet radio. The only thing that lacks for us is the 'My Collection' not functioning properly: we'd like to add our own tracks for offline playback, but haven't been able to do so. Nonetheless, Google Music and Bluetooth playback has sufficed, with the Libratone app still taking control of remote volume adjustment and play/pause/skip track. The key reason to spend a bit extra on a speaker is how good it sounds. And the Zipp 2 sounds really great. Compared to its predecessor, Libratone has tweaked the tuning and used algorithms that can assess room space to deliver greater bass levels and more accurate sound. Has that made a huge difference in reality? Well, the bass response isn't as gigantic as some other products of this size. The low-end is still very present, though, with bass-laden tracks bubbling along nicely. Overall, however, the sound is great for two reasons: it's very loud and can fill large spaces; and the various presets genuinely enhance the listening experience. Within the app it's possible to select various 'voice' presets that adjust the equaliser (EQ) to suit different genres; there are also four presets for product positioning - which help deliver the optimum sound for shelf, table, floor, outside or keep things neutral (and the difference between them all is immediately obvious). Best of all, however, is the room correction feature: press-and-hold the nightingale touch controller, then hit room correction, which allows the Zipp 2 to (silently) scan its surroundings to judge surfaces and reflections to create an enhanced sound profile. It works in seconds without fail and is a massive bonus - especially for a product that's so versatile for its placement opportunities. The 360-degree design ensures sound is projected in multiple directions, which works very well. Some spots are marginally sweeter than others - the tweeter might sound a smidgen more prominent from some angles - but it's a genuinely immersive output for a whole room. It's great for giving tracks three-dimensionality from a single speaker, with traditional studio recordings sounding really well separated and dynamic. We've only received the one speaker, so haven't been able to test stereo linking or SoundSpace multi-room, but both are also possible. 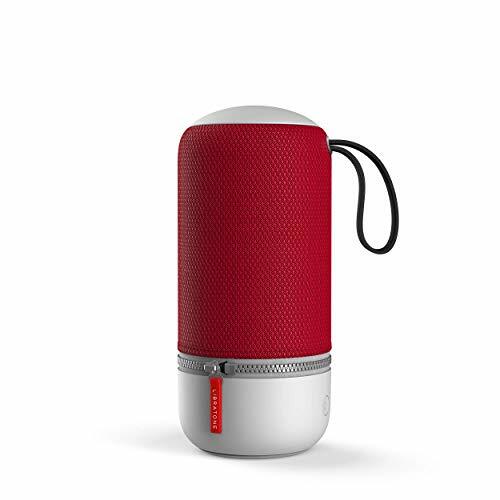 Like an Amazon Echo Plus on steroids that's wearing a striking Scandinavian ski jacket: the Libratone Zipp 2 is a great wireless speaker with Alexa voice control that's stacked with connectivity options and audio that trounces Amazon's own options. Its main downside is that it's pricier than Amazon's own options, the Sonos One and Ultimate Ears solutions. It is worth the extra cash, but those additional digits might initially swerve some buyers away from it. Overall, the Libratone Zipp 2 is hygge in Hi-Res form. We love the design and features - and anticipate that it will remain our portable at-home speaker of choice for the foreseeable future, as it has done for the past five weeks. A little smaller, waterproof, more affordable and, therefore, likely the overall better choice for outdoors use. It sounds great too. Amazon's best voice-controlled Alexa speaker doesn't have the same audio grunt as the Zipp 2, but it is cheaper and you can add an Echo Sub for more low-end punch.